Back in December 2012, I wrote about reading Robert Macfarlane’s The Old Ways: A Journey On Foot, and commented then on how few women walkers there seemed to be; how few women seem to casually drop things and wander off to walk in the way that Macfarlane does. They seem either tied to a very small piece of ground (Nan Shepherd – walking into the landscape rather than across or out of it) or else emphasis is laid on their singleness (i.e. the implied freedom to move around) and their interactions with men as they travel (I was struck by this in the readings of Cheryl Strayed’s Wild I heard on the radio, but it is an old, old trope). This morning, reading Kathryn Schulz’s New Yorker review of Helen Macdonald’s award-winning H Is For Hawk, it occurred to me that there is another aspect to this, and that’s illness – in particular, grief. Or, rather, in Macdonald’s case, as a falconer, she has always been able to walk the landscape on her own, with the hawk on her wrist as a spurious indicator of authority for her right to be there. But it is her father’s death and her grieving over that death, embodied in her decision to train a goshawk, that grants her ‘permission’ to write about it. I read the book over Christmas and liked it very much. I will write about it at some point, I’m sure, but for now, I’ll say only that my reading was not framed exclusively in terms of of Macdonald’s struggling with grief to a level that seems almost irrational to anyone who hasn’t experienced it, and so far I have not (although, undeniably, this is in part what Macdonald wrote about). Instead, I saw it more in terms of the discipline of training a goshawk imposing some sort of shape to Macdonald’s life at a point when she had few other anchors. And yes, by Macdonald’s own admission, there is a point where she recognises that she has in some way gone feral, but to me it’s significant that she can see this and act upon it. Yet Schulz frames this element of the book in terms of ‘coming home’. Macdonald’s story has a different ending. One day, crouching over a rabbit she has just killed, feeling like “an executioner after a thousand deaths,” she comes to see that she has been travelling with her hawk not further from grief but further from life. Scared by her own numbness and darkness, she begins to seek help: from loving relatives, attentive friends, modern psychopharmacology—all the advantages she had that White did not. Slowly, her grief starts to lift. As it does, she finds that she disagrees with Merlyn and Muir. “The wild is not a panacea for the human soul,” she writes. “Too much in the air can corrode it to nothing.” All along, she had wanted to be her hawk: fierce, solitary, inhuman. Instead, she now realizes, “I was the figure standing underneath the tree at nightfall, collar upturned against the damp, waiting patiently for the hawk to return.” Her father, she knows, will never rejoin the human world. But she can. Like a figure in a myth who followed a hawk to the land of the dead, Macdonald turns around and comes home. There is a delicate path to be traced through this, because on the one hand, Macdonald knows better than any of us what it she experienced, and I cannot and must not presume to understand her grief better than she does. On the other hand, I found myself bridling somewhat at Schulz’s ‘comes home’. Perhaps it’s because I’ve come to believe that you never can come ‘home’, because ‘home’ is always behind you. Where you arrive is not where you left, even if it looks the same, because you are not the same. Tolkien may put those famous words, ‘Well, I’m back’, into the mouth of Sam Gamgee, but ‘back’ implies that everything is precisely as he left it, whereas we know that it is anything but. Not all the restoration in the world can alter that fact. To me it seems that to recognise that ‘The wild is not a panacea for the human soul’, as Macdonald does, is not the same as to reject it, something I don’t think she does. But home? With all the connotations that carries? I wonder. I found myself thinking of Margery Kempe, the fourteenth-century mystic. she was an extraordinary woman, famed for her impassioned weeping. No wonder she wept. The mother of fourteen children, some of whom may have survived to adulthood, she clearly experienced at least one episode of post-natal depression, possibly more. She experienced visions, which she, being illiterate, persuaded someone to write down for her. She sought a chaste marriage with her husband, and travelled extensively on pilgrimages, and also to visit the other mystics of her times. Should we think of her as someone who sought to come home, or who carried on travelling? Another book out recently is Katharine Norbury’s The Fish Ladder: A Journey Upstream, in which Norbury begins a walking project in order to assuage her grief after the loss of a much-wanted child because of a miscarriage. Again, the walk is framed as a project to ameliorate a feeling rather than as something that exists as a thing in and of itself. Can the walk only be justified because it has an ulterior, distracting purpose? This entry was posted in non fiction and tagged cheryl strayed, h is for hawk, helen macdonald, nan shepherd, new yorker, robert macfarlane, tolkien on March 9, 2015 by maureenkspeller. I read Rebecca Mead’s New Yorker article, ‘The Percy Jackson Problem’ (22/10/2014) with mounting irritation. And then wondered why I was so irritated by it. Children’s reading habits are of no particular interest to me, except, of course, that they are. Indeed, there is an extent to which they must be so long as we continue living in word-based cultures. And despite all the claims people make about the shape of the future, my feeling is it’s going to be predominantly word- rather than image-based for a long time to come. That misplaced, or perhaps overly nourished, nostalgia, I’ve come to realise, has expanded in a number of ways, not least to address the ways in which we expect children to engage with texts, and in particular, the way in which a story is told. This has been vaguely simmering at the back of my mind for a while, not least with the fondness of sf commentators of a certain age for recommending Robert Heinlein’s stories as starter texts for young people interested in reading sf. I had cause to reread Starship Troopers last year and was genuinely shocked by how dreadfully old-fashioned it was, yet I regularly see it recommended as a good piece for modern teenage readers to begin with. It is as though, in some perverse way, the sf community doesn’t want young people to read sf. By all means teach it as part of a historical survey of science fiction, but for pleasure? I think that’s something readers need to come to for themselves. So why recommend it? Nostalgia? Yes, of course. I’m sure many people recommending it cut their sf reading teeth on the Heinlein juveniles, and remembering them with pleasure, wanted to pass on that pleasure to a new generation of readers. (I appear to be in a minority in that I read them because they were in the library but took little if any pleasure in them and retained no memory of them.) Which is fine so far as it goes yet it takes no account of how the world changes. This, I think, is at the heart of Rebecca Mead’s complaint. Her concern is with Rick Riordan’s Percy Jackson books, or rather, with Percy Jackson’s Greek Gods, in which our eponymous hero has been asked by his publisher to retell the Greek myths in his own inimitable way. In case, like me, you’ve missed the Percy Jackson phenomenon, Percy has discovered that he is not an inept adolescent but a demigod, a son of Poseidon and a mortal woman. As a result, he is sent to Camp Half Blood where he meets various other demigods and starts to learn the skills that befit his position. Hogwarts for classical bastards, you might say. I’ve not read any of the Percy Jackson novels, and I suspect a steady diet of them might pall about as rapidly as the Harry Potter series did, somewhere around book five, film three. But that’s not a problem because on the whole they are not meant for middle-aged women, unless perhaps they’re studying classical reception in the twenty-first century, and I’m not (though if it’s children’s books about Native Americans? Very different). The whole point is that the Percy Jackson stories are written with a very specific audience in mind by a man who taught that specific audience and knows what they like. Which is, as Mead put it, ‘a slangy, casual style […] which often read like a faithful transcription of teen uptalk.’ And Mead is at great pains to suggest that the books are deliberately written to keep adults away (unlike the Harry Potter novels which are, of course, for everyone; Mead is keen on a number of occasions to represent the Harry Potter novels as being somuch better). From Mead’s brief descriptions, it seems that Riordan has very cleverly adapted the gods of classical mythology for contemporary America in a way that appeals to teenagers while being faintly reminiscent of Neil Gaiman’s American Gods. So what, you might ask, is Mead’s problem? Apart from that sense that there’s something going on that her children have access to while she doesn’t? She seems prepared to concede the popularity of the main series but has baulked at Greek Gods because of its being ‘inscribed with obsolescence (Craigslist, iPhones, and the Powerball lottery are invoked) and delivered in the kind of jaded teen argot that proves irresistibly cool to kids from grade school up’. Apparently, actual retellings of myths and legends require something else. But what might that be? If I think of retellings of myths and legends from my childhood I immediately turn to Roger Lancelyn Green and Ruth Manning-Sanders, both lovely storytellers – indeed, I still own several retellings by Lancelyn Green and reread them with pleasure. But we have to face the fact that the language is rather heightened for modern tastes and while they’re texts I would read to a child, they’re not texts I’d ask a child to read on its own, though if a child were to find them in the library and read them of their own volition, I’d naturally be delighted. This, I think, is Mead’s difficulty. Percy Jackson’s Greek Gods is a book a child will happily read if asked, or by its own choice, but it is not a text a parent can as easily engage with. Mead as good as admits it herself when she draws on her own reading memories and on school syllabuses and comes up with Ingri and Edgar Parin d’Aulaires’ Book of Greek Myths, something which I suspect is better known in the USA than over here. It was originally published in 1962; in other words, it’s over fifty years old. In olden times, when men still worshiped ugly idols, there lived in the land of Greece a folk of shepherds and herdsmen who cherished light and beauty. They did not worship dark idols like their neighbours, but instead created their own beautiful, radiant gods. In the beginning, I wasn’t there. I don’t think the Ancient Greeks were, either. Nobody had a pen or paper to take notes, so I can’t vouch for what follows, but I can tell you it’s what the Greeks thought happened. At first there was pretty much nothing. A lot of nothing. The first god, if you can call it that, was Chaos – a gloomy, soupy mist with all the matter of the cosmos just drifting around. Here’s a fact for you: Chaos literally means the Gap, and we’re not talking about the clothing store. Interesting differences, I think. The d’Aulaires start from the point of view of the people who created these gods, and their gods are beautiful and radiant. No mention of Uranus being castrated, for instance. The Percy Jackson retelling, by comparison, is more upfront and features a chapter called ‘The Golden Age of Cannibalism’! The Jackson retelling is colloquial and vivid, like an older sibling telling a story, while the d’Aulaires’ version is very serviceable but not really that exciting. Indeed, it seems rather to talk down to its audience. It’s clear which version a modern child is going to choose, and a parent who is surprised that it’s the Percy Jackson version is clearly not paying attention. Which brings us to a further problem, again one highlighted by Mead. Should we leave children to find books for themselves or should we be prescriptive. In her article, the laissez-faire approach – ‘just so long as they’re reading’ – is expressed through reference to Neil Gaiman’s lecture given on behalf of the Reading Agency (link in the article), which argues that it’s all too easy to kill a child’s enthusiasm for reading by forcing texts on it. It’s a view I have some sympathy with. Like Gaiman, I’m a product of the ‘laissez-faire’ approach, to the extent that I was pretty much left to my own reading devices as a child, though I suspect his libraries were rather better stocked than mine, and if the story I heard is true, I did not have sufficient chutzpah as teenager to blag a reading ticket to the Bodleian in the same way he managed to obtain one to the British Library. Then again, we both liked books, we both liked reading, we were always going to find ways to get to books. My siblings grew up in the precise same circumstances as me, with the same outlets available to them. One read nothing but Mills and Boon while the other eschewed fiction for extremely dense books about the architecture of the Great Western Railway, which he could discuss with great enthusiasm from an early age. There are people who would regard my siblings as somehow lesser because they don’t read the Guardian Review or have an opinion about the Booker Prize (and I have to say it’s really hard to make conversation with people who don’t share your interests) but the fact remains that they function perfectly well in the world. There is even the possibility that I am in the minority rather than them. The contrasting argument comes from Tim Lott (link in the article), who suggests that if you don’t give children and teenagers ‘good’ stuff to read, they won’t find it on their own. In effect, they must be made to find it, or have it forced upon them. His argument, that E L James does not lead to Shakespeare, is valid so far as it goes, but then again, did anyone ever say that it would? I don’t think so. Lott’s problem seems to be that he feels young adults don’t have the grounding in literature that they once did, which might point to a problem with the way the educational system delivers its literature teaching these days but does not, I think, suggest that children themselves have changed. Rather as I disliked reading Jane Austen as a teenager, most of the students in my first-year lit class did not enjoy Northanger Abbey. On the other hand, they spoke knowledgeably about a wide range of so-called classic writers and at times gave extremely nuanced readings of the texts they enjoyed. Not all of which they had read in order to pass exams. Which one would hope for as they were English Literature students. But that is surely the point. They trained to be there, they (mostly) wanted to be there. They could read E L James for fun, admit it was rubbish, and discuss Shakespeare and Plath as well. Somewhere behind them are all the people who were obliged to read Romeo and Juliet to pass an exam, who will never read one of Shakespeare’s plays ever again. Are they intellectually impoverished? Maybe, if they decide to go to university later, but on the whole, probably not. And this is my problem. It seems to me that there are as many experiences of reading as there are people reading, but no one actually wants to admit that the world is not going to end if Mead’s children learn about Greek myths from the Percy Jackson stories (she admits herself that they know a good deal as a result of this encounter) rather than from the d’Aulaires’ version or older translations. If they’re interested, they’re going to read more. If they aren’t, why make them. Indeed, we might even end up with a situation where a new generation of children know considerably more about the myths than their parents did, because the Percy Jackson books have encouraged them to read more. The same holds true for a lot of other things. I’ve always thought that if you want to interest teenagers in Shakespeare, take them to see the plays or act out versions rather than expecting them to simply read round the class, as happened in my day (my first trip to the theatre to see Shakespeare performed was a revelation!). Why not update them? If it sparks interest, the original text hasn’t gone away just because there’s a new version in town. So, I suppose I’m sitting here on this new fence I’ve built, arguing that yes, children need to be left to their own devices, but that it’s also good to push a few improving texts their way if you accept your suggestions might be rejected, so don’t force it. But mostly, I think I want us to eschew Rebecca Mead’s fastidious veiled snobbishness and accept that just because our children read it doesn’t mean it will appeal to us, and that just because we loved X, it doesn’t follow that our children will too. The world has changed. This entry was posted in non fiction and tagged d'aulaire, greek myths, harry potter, jane austen, neil gaiman, new yorker, percy jackson, rebecca mead, rick riordan, robert heinlein, starship troopers, tim lott on November 3, 2014 by maureenkspeller. Time for another round-up of interesting things on the internet and elsewhere. First of all, I must draw your attention to Speculative Fiction 2012, edited by Justin Landon, of Staffer’s Book Reviews and Jared Shurin of Pornokitsch. It’s the first of what many of us fervently hope will become a regular annual collection of online essays and reviews about sf, the fantastic, and other genre material, all conveniently collected in one place. It is a fantastic anthology of articles and reviews, some by people whose work I already admire intensely, some by people whose work I’m reading for the first time and already looking forward to reading more. And if it seems that I am being just a little bit circumspect in discussing the collection, that would be because I’ve got a couple of pieces in it myself and I must recuse myself from reviewing something I’m part of (though Niall Harrison offers us a hypothetical not-review here– the real problem is that most of the people who would normally review a volume like this are actually in it). I am though immensely proud that my work has been included in this inaugural volume. My criticism appears in print as well as online but I’m very conscious of the fact that, for example, newspaper-based literary critics regularly bash blog-based critics, implying that their work is less worthy of consideration because it’s published online. Equally, I’m well aware that some book bloggers work with a set of critical criteria that seems to begin with gushing and end with squeeing and in between offers little but uncritical adoration of each and every volume the blogger lays eyes on. More than all of that, I know that there are so many book blogs out there it’s almost impossible to keep up with what’s going on. Speculative Fiction 2012 reminds us that there’s a lot of good-quality critical writing happening online and provides pointers to where it’s happening. Nominations are already open for the 2013 volume, to be edited by the Booksmugglers, Ana Grilo and Thea James, who discuss the terms of their editorship here and provide a nomination form. Nominate early, nominate often, nominate diversely. 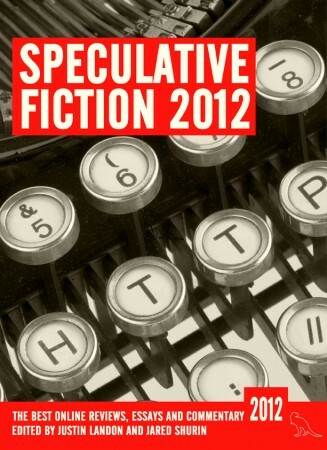 One of the pieces chosen for Speculative Fiction 2012 was my review of the New Yorker sf issue, published in June 2012. Laura Miller’s article from that issue, ‘The Cosmic Menagerie: What did the first fictional aliens look like’, is currently available and well worth a read. In other news, Radio 4’s Woman’s Hour will feature an article asking what’s happened to the tough women in sf. I confess I feel a certain trepidation about this, but we’ll see. I won’t get my Clarke shortlist reading done before the announcement on Wednesday but Pornokitsch offers an imaginary judgement. This entry was posted in awards, miscellaneous and tagged clarke award, new yorker, speculative fiction 2012 on April 28, 2013 by maureenkspeller.